Enjoy a prestigious and unique experience in Los Mariachis Madrid Polo Club. Located just a short drive from Madrid Los Mariachis Madrid Polo Club offers private polo lessons for horseback riders of all abilities, from never-ever beginners to experienced equestrians. On this day you will take a one-hour class from a professional argentinian polo player, enabling you to gallop on a horse across the field and swing a polo mallet like a pro! You can also bring your children to enjoy a lovely ride in a pony horse along the river. Max. number of person per transport: 08 persons. Polo lessons: + 12 years old. Pony ride: 4 - 12 years. Located just a short drive from Madrid Los Mariachis Madrid Polo Club offers private polo lessons for horseback riders of all abilities, from never-ever beginners to experienced equestrians. Horse and rider in harmony, they pound across the turf and jostle for position—a mass of muscle, speed and sweat battling for a swing at one small ball. Meet your Drivers and small group outside of your hotel for a maximum 30 minutes drive to Los Mariachis Polo Club. Upon arrival, enjoy the peaceful scenery surrounded by horses and a large peaceful landscape. Enter the ranch clubhouse and snack on cake, coffee and tea and Mate. Head to the polo fields for the first lesson of the day, which is tailored to your skill level. Receive a safety briefing and then climb on to a horse selected for you according to your riding ability. Rest assured that whether you've never ridden a horse or are a practiced polo player, your professional instructor will teach to your experience. Grab your polo mallet, called a taco, and start swinging. 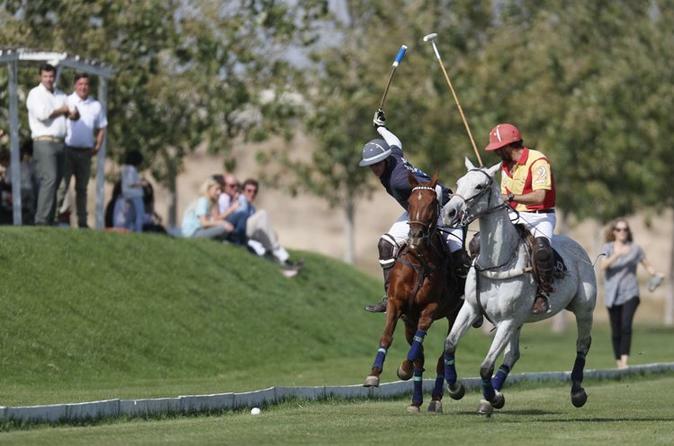 Compete in an exhibition polo match with a team and enjoy racing your steed down the field in pursuit of the ball. Climb in to your vehicle for the ride back to Madrid. Please note: A minimum of two people per booking is required.